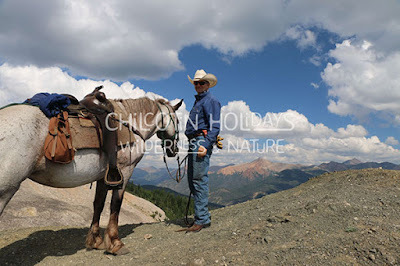 If you're looking for fun and adventure, Chilcotin Holidays is the place. For me, it was worth the long drive. The week spent up there was fun.I went up with my sister. She was in Guide school. When I wasn't riding, I learned about stuff from the Guide School. Things like hobbling, tail tying, leading a horse, peaking, riding, and even horseshoeing. Next time I hope to do target practice with the biatholon rifle. Up at Chilcotin Holidays, I saw tons of deer and a baby moose. On the way home I saw a bear. While I was up there, I rode three different horses. Pam, Dillan and Ug(King Cayuse). I had fun riding up in the mountains looking for horses, especially when me and Steve caught Fred. Up there I met a lot of nice people. One thing I missed when I got home was the great food. Next time, I think I'll go for longer and take the guide school. I look forward to coming back again!